2016 Porsche 911 Carrera S Cabriolet review | What Car? This is the new Porsche 911 Cabriolet, here in its quickest Carrera S iteration. Although it looks largely the same as before, you can tell it apart by the vertical slats in the retractable rear spoiler and the two centrally mounted exhausts tailpipes that replace the four exhausts of the previous car. The bumpers and lights are also different, but only subtly so. The biggest change is to the engine. For a start it’s now 3.0 litres instead of 3.8 litres, and to make up for its smaller capacity there are two turbochargers. These not only make it quicker than before but also more economical. Inside it’s much the same bar an upgraded infotainment system, which provides a sharper screen and better graphics as well as Apple CarPlay to connect your iPhone. There’s no MirrorLink for Android users, though. 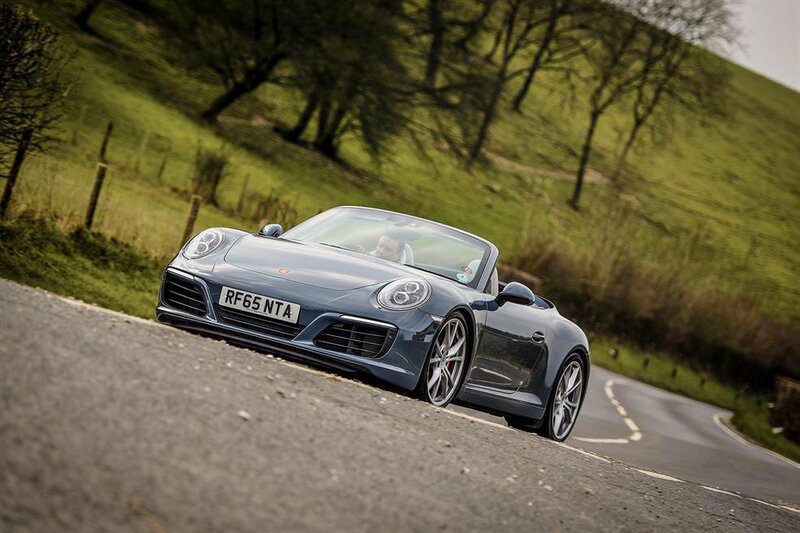 What’s the 2016 Porsche 911 Carrera S Cabriolet like to drive? It’s fabulous. The new engine provides a lot more low-down shove than the old one, and it starts from around 2000rpm. You can exploit this when you just want to cruise and make good progress without continually needing to change gears. That’s not to say changing gear is any sort of chore, thanks to the new-found lightness of the clutch and a slick seven-speed manual gearbox. It's great that you can still buy the 911 with a manual gearbox, unlike auto-only rivals such as the Jaguar F-type R Roadster and Mercedes SL 500. You can, of course, option your 911 with a PDK dual-clutch automatic gearbox, which takes the stress out of town driving but doesn’t feel quite so engrossing to drive. If you want maximum acceleration, the engine pulls even more strongly past 4000rpm and revs freely all the way to the its 7500rpm maximum. It sounds good, too, but perhaps without quite the visceral howl of the old car. It definitely lacks the drama of the F-Type's V8 engine, too. The handling, though, is as alert as ever. The 911, like many cars these days, isn’t as light as it once was. Nevertheless the Cabriolet feels lighter on its feet than either the F-Type or the SL 500, and arguably more precise to drive. With the standard variable dampers in their firmest setting the body control is tight, while the steering is direct and weights up progressively. It gives you the confidence to push, and when you do it’s astonishing how much grip the front tyres offer, and the rears are similarly well anchored as you feed in the power. The 911 can also be a great mile-muncher; put the dampers in their soft setting and the ride is surprisingly compliant. It still fidgets over patchy town roads, but even on optional 20in wheels it settles down the faster you go. There is a fair amount of road roar at speed and the soft-top lets in more noise than the 911 coupé’s fixed roof, but it’s still relatively relaxing with very little wind noise. With the roof down it is mostly bluster-free as well, especially with the standard electrically operated wind deflector in place. What’s the 2016 Porsche 911 Carrera S Cabriolet like inside? Very well finished, like all 911s, and despite the rather alarming number of buttons it’s pretty easy to operate. The new infotainment system is also an improvement. It’s quick and slightly easier to use than the Jaguar or Mercedes systems, although it retains the ability to baffle as you search for some of the less frequently used features. Front space is exceptional for a sports car and there’s lots of adjustment to the steering wheel and seat, meaning all shapes and sizes can get comfortable. Not so in the rear seats, though, which are only suitable for kids, but that’s still an improvement over the two-seat F-Type and SL. The rear seats also double as extra storage for bulky items such as a set of golf clubs, but the smallish boot in the 911's nose is really only suitable for a couple of weekend bags. The previous 911 Cabriolet was our favourite open-top sports car at this price point, and rather than lose anything, it’s only got better. Okay, the purists might argue that it has lost some character thanks to the marginally quieter engine note, but we still think it sounds great, particularly if you opt for the £1773 sports exhaust. The engine’s added low-down shove makes it easier to use in everyday situations and the gains in efficiency – while perhaps not a top priority for prospective buyers – give it an edge next to the thirsty F-Type R.